Ukraine has witnessed a new criminal case brought by Kyiv's tax authorities against Mykola Knyazhutskyi, the Managing Director of TBi. The case against the head of the most reputable television channels represents a government effort to curb any signs of opposition. Yuliya Tymoshenko, a former Prime Minister and prominent opposition leader, is currently serving her sentence in Kharkiv, having been charged with tax evasion and betrayal of national interests. TBi is also accused of tax evasion to the tune of six million hryvnas. Knyazhutskyi has denied any wrong doing, highlighting the political nature of the alleged criminal offence. The target of the investigation, as well as the rationale behind its timing, are clear. TBi is seen by many as the most independent voice in a media environment where dzhynsa - paid journalism - remains the norm. According to a public survey conducted in June 2012 by the Academy of the Ukrainian Press, TBi is ranked as the most balanced news outlet in the group of eight national broadcast channels. It is seen as fair in providing air time to opposition parties and focusing on such controversial topics as the personal wealth of Ukraine's ruling elites and government procurement practices, exposing high-level corruption and tax evasion. The network's team has been making a conscious effort to educate the public on the importance of investigative journalism as a way to develop civil society in Ukraine. “TBi is a unique media outlet. Most of our journalists are very well known and extremely active in social media. In such a way we will not disappear from the Ukrainian media space. And I truly hope that people who continue applying pressure on our channel will soon be forced to leave the political establishment” emphasized Knyazhutskyi. 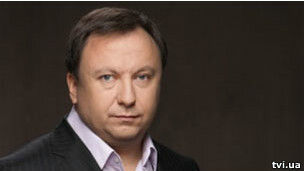 TBi's troubles began in 2010, when Ukraine's National Broadcasting Council suspended the channel's operating license in favor of the pro-government Inter. That year also marked the appearance of the new political regime led by Victor Yanukovych and the beginning of a slippery slope in Ukraine's democratic values. According to the Democracy Index compiled by the Economist Intelligence Unit, Ukraine was ranked 52nd in 2006, while in 2011 it occupied 79th place due to the progressive curtailing of freedom of expression and increased censorship. The revival of political pressure on TBi is most likely linked to the upcoming parliamentary elections scheduled for October, where the role of media will be decisive in shaping public opinion. Current surveys demonstrate high levels of public support expressed towards the pro-government Party of Regions and Tymoshenko's Batkivshuna. While the fate of TBi remains uncertain, the channel's team and its leadership continue to express healthy optimism. “We are not going to immigrate and we are not going to ask for political asylum. And I am convinced that we will win through the existing legal channels” said Knyazhutskyi. It was not very long ago that Ukrainians marched through the streets of Kyiv in a peaceful protest that came to be known as the ‘Orange Revolution’. Many have already forgotten that the prelude to this democratic outpouring was the movement titled ‘Ukraine Without Kuchma’, spearheaded by journalists in search of their professional rights. Read also "Boiling Ukraine - Getting Ready for the Next Revolution."